Summary: Antoinette, the precious poodle from Gaston, is happy living with her bulldog brothers. Rocky is clever, Ricky is fast, and Bruno is strong. But Antoinette hasn’t discovered any special gift of her own. Every day, Antoinette’s family meets up with Gaston’s to play in the park. One day, a problem arises: young Ooh-La-La has gone missing, last seen chasing a butterfly. All the dogs join in the search, but it is Antoinette who refuses to give up, following the scent all the way to the museum. Even when a guard yells, “No dogs allowed!”, Antoinette persists, and arrives just in time to save Ooh-La-La from chasing the butterfly off the edge of a high statue. 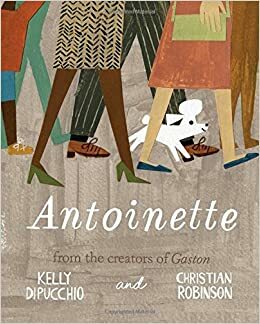 Antoinette has discovered her gift, and she continues to use it into adulthood, becoming one of Paris’s most famous police dogs. 40 pages; ages 4-8. Pros: Kids who have loved Gaston will not be the slightest bit disappointed with this sequel. It’s billed as part of the series Gaston and Friends; we can only hope for more to come in the near future. Cons: Ooh-La-La = not too bright. I loved the Ooh-La-La name for the dog.